Two nationalist books were launched recently: Bayan at Lipunan: Ang Kritisismo ni Bienvenido Lumbera edited by Rosario Torres Yu and published by the University of Santo Tomas Publishing House, and the fifth edition of Philippine Society and Revolution by Amado Guerrero issued by Aklat ng Bayan. Lumbera is a Ramon Magsaysay awardee for literature; Amado Guerrero is Jose Maria Sison, founder of the reestablished Communist Party of the Philippines (1968) and now Utrecht-based chief political consultant of the National Democratic Front (NDF) in the on-and-off peace negotiation with the Philippine government. Torres-Yu is a UP professor and authority on Amado Hernandez’s literary works. Since Bien Lumbera assumed the leadership of PAKSA (Panitikan para sa Kaunlaran ng Sambayanan) in 1970 he has been influential in developing the aesthetics of nationalist literature grounded in Mao Zedong’s Talks at the Yenan Forum on Art and Literature. At the book launch, critic Isagani Cruz said he first encountered postcolonialism in Lumbera’s graduate class at the Ateneo in the late sixties. That might well be since postcolonial discourse appropriates practically all Third World writing or emergent literatures which Bien taught in the academe. Postcolonialism is a portmanteau word first used by British critics to supplant "commonwealth literature" which encompassed all writing in English in former colonies including the Philippines. But nationalist writers like Epifanio San Juan would not subscribe to postcolonialism as theory and practice in the Philippine context. San Juan takes issue with postcolonial thinking that "condemn[s] the nation and its corollary terms, ‘nationalism’ and ‘nation-state’ as the classic evils of the modern industrial society." How then could Lumbera be a postcolonial critic (except in the most liberal sense) when he is first and foremost a nationalist writer. Bayan at Lipunan and other works attest to this. Nationalism in this sense is the ideology of the struggle toward national liberation of the vast majority of Filipinos from suffering and poverty resulting from elitist and neocolonialist rule. I remember in a 1956 symposium held in UP, American Fulbrighters questioned why the speakers (Jose Lansang, O.D. Corpuz, Cesar Majul and others) were pushing for nationalism when it was this ideology that produced Mussolini and Hitler and "ethnic cleansing" (shades of postcolonial thinking). They did not mention that US nationalism produced William McKinley and his "benevolent assimilation" (where a quarter million Filipinos died), the Monroe Doctrine, US expansionist policies in the Western Hemisphere and Asia (and now Bush’s "war on terror"). Lansang did tell the Americans that it was well for them to criticize Filipino nationalism for they already had achieved theirs by annexing this country. Obviously there are oppressor nations and oppressed nations. 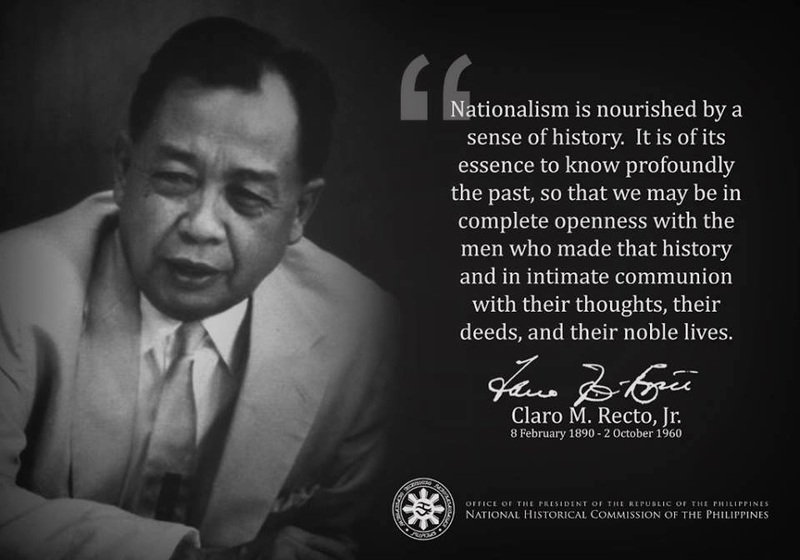 Nationalism is the basic ideology of Philippine Society and Revolution (PSR) which was first issued in 1970. Early versions (Philippine Crisis) appeared in mimeograph and in the Philippine Collegian and Ateneo’s Guidon in the late sixties (as recalled by Monico Atienza). PSR, which uses the materialist approach in its historical account and Marxist class analysis in its dissection of Philippine society, became the primer of young activists who had also read Sison’s Struggle for National Democracy, Teodoro Agoncillo and Renato Constantino. With these readings they were just a step away from reading the works of Marx, Lenin and Mao. The fifth edition of PSR reproduces the original text with slight revisions for the author and publisher maintain its continuing relevance in a "semi-feudal and semi-colonial" society like ours. As Luis Teodoro quotes, "the more things change, the more they are the same." The land question, bureaucrat/crony capitalism, and US imperialism (now in the vesture of globalization) remain unresolved. The fifth PSR edition may be compared to the third (1979) and fourth (1996) editions which include two "praxis" documents: Specific Characteristics of People’s War (1973) and Our Urgent Tasks (1976). The fourth edition has excerpts from later writings of Sison. The Bibliographical Dictionary of Marxism (London, 1986) lists Sison as among the most important 200 Marxists since the 1848 Communist Manifesto. Historian Agoncillo in 1985 said that Sison was one of three most influential revolutionary leaders after Andres Bonifacio and Crisanto Evangelista. Those who had pronounced the demise of communism/nationalism in this country may well eat their words considering that the National Democratic Front seems to be gaining ground not only in armed encounters and areas but in the hearts and minds of people here and abroad. With this apparent stalemate (neither side can’t defeat the other) the peace process deserves to be accelerated.